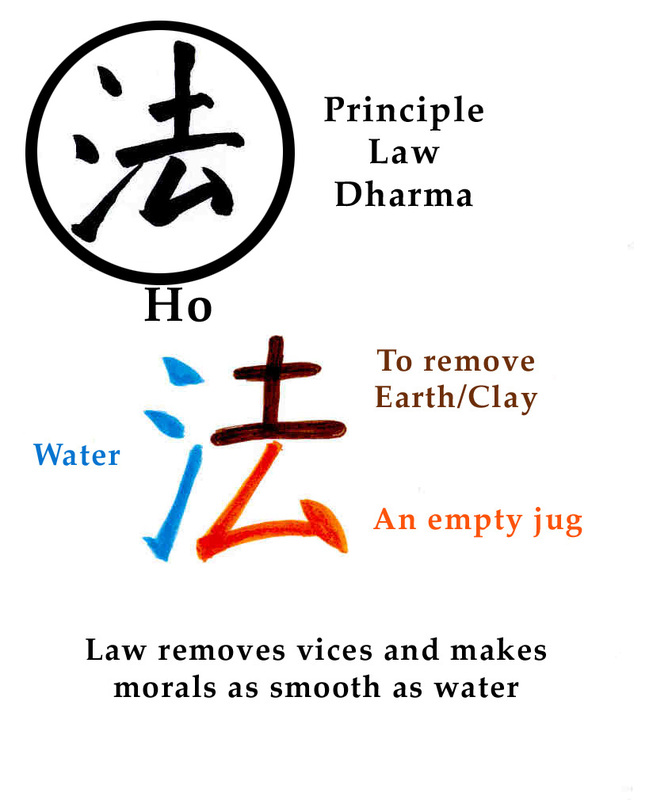 The character that Nichiren Buddhists pronounce ho is fa in Chinese (and dharma in Sanskrit). It means "rule," "law," and, by extension, "model" or "pattern." The modern form (used in the gongyo book) is composed of two elemental characters: chu, the character to the right and shui to the left. Chu Chu looks like a music stand. The triangular base of the stand is a vessel or jug. The telephone pole-like structure above it is the jug's cover. It means to remove, to lay aside, to leave. Removing the jug's cover and contents leaves it empty. Shui Shui is two dots and a semi-vertical line. The vertical line represents a stream; the two dots are whirls of water. It means "water." Jug? Water? How could this mean "Law?" Cheng is footprints leading directly to the crest of a hill then viewing all directions. Because the prints do not stray, cheng means "righteousness." Dr. Martin Luther King Jr. wrote: "We will not be satisfied until justice rolls down like waters and righteousness like a mighty stream." Click here for a full-size printable version of the explanation of Ho (at left).